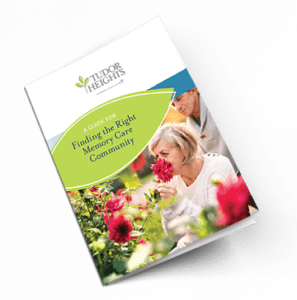 Your guide for finding the right memory care community. A diagnosis of Alzheimer’s or other related dementias can be a life-changing event for both those with the disorder and for those close to them, and the process of considering a memory care community for a family member is not unlike any other important life decision. The more information you have, the better equipped you will be to match your family member’s needs with a memory care community based on their approach, programming, treatment and care. Call 410-318-8000 or complete the form to receive your copy of Tudor Heights’ A Guide for Finding the Right Memory Care Community.